Stocks are lower after Q4 GDP disappoints. Bonds and MBS are up. Fourth Quarter GDP came in at 2.6%, lower than the 3% estimate from the Street. Consumption came in better than expected, which is a bright spot. Inflation remains nowhere to be found, as the core PCE Index (the inflation measure preferred by the Fed) came up zero. The Employment Cost Index fell to 0.6% in Q4, matching expectations. Overseas, rates are lower again. The Great Bund / JGB convergence trade continues, with the spread under 5.5 basis points. On the other side of the coin, Greek yields continue to rise, with the Greek 10 year now yielding 10.8%. Household formation grew 4x to 1.7 million in Q4 from a year ago. Granted, the vast majority of these are renters, but they probably will buy houses at some point. Think of what 1.7 million housing starts would do for the economy. That is just an indication of how much pent-up demand there is in the housing sector. The homeownership rate fell to 64% in the fourth quarter, however the lowest since the mid 1990s, when we began this huge experiment in social engineering via housing policy. So far, we are not seeing much of a slowdown in the energy patch states as a result of lower oil prices. This was echoed by builders Horton and Pulte. Of course it is still early in the game. Stocks are higher after yesterday’s bloodbath. Bonds and MBS are down. Germany’s inflation rate turned negative in January for the first time in 5 years. QE is coming just in time. The German Bund yields 35.3 basis points, or about 6 basis points more than the Japanese Government Bond. It is amazing to think a country that didn’t experience a massive real estate bubble has interest rates that low. Initial Jobless Claims fell back below 300k. Looks like the usual post-seasonal layoffs are done. The Bloomberg Consumer Comfort index rose last week to 47.3. Pending Home Sales fell 3.7% month-over-month in December. They are up 8.5% year over year. The general take on the FOMC statement was hawkish, at least the way they characterized the economy. They said the economy was improving at a “solid pace” with “strong job gains.” Quite the change after a half decade worth of terms like “subdued,” “modest” and “moderate.” Actually the only weak spot was housing, where the recovery remains “slow.” One change from December involved the acknowledgement of overseas economic issues. “International developments” will now help shape monetary policy. I think bonds keyed off that statement. If Europe is indeed heading for a recession with rates already at the zero bound, then the Fed may choose to stand pat in June, or only make a symbolic increase to get off of the zero bound. Speaking of the Fed, Bill Gross thinks the Fed is moving this year, and delves into some of the unintended consequences of ZIRP. The biggest problem with ZIRP is that it skews the risk / reward of investment – the upside is limited by low rates, but the downside is the same as ever before. This encourages people to keep their money in the mattress. Money quote: “Capitalism depends on hope – rational hope that an investor gets his or her money back with an attractive return. Without it, capitalism morphs and breaks down at the margin. The global economy in January of 2015 is at just that point with its zero percent interest rates.” This is why Bill thinks the Fed moves this year, even though European weakness gives them the perfect excuse not to. The stock is up about 150 basis points this morning. Markets are higher after yesterday’s sharp sell-off. Bonds and MBS are flat. Mortgage Applications fell 3.2% last week as purchases fell .1% and refis fell 5.1%. There is anecdotal evidence (Redfin and also D.R. Horton) of buyer demand for homes, which bodes well for business this year. The wrinkle is that buyers are highly price sensitive and are not chasing homes, even though rates are lower. Existing home inventory is at 4.4 months, which is well below the mid 5s we have been seeing for years and the mid 6s, which indicates a balanced market. Mel Watt testified before the House Financial Services Committee yesterday. Here are the prepared remarks. He more or less defended an activist government role in the housing market. On the subject of principal mods for Fannie and Freddie loans, he told the left that the check is in the mail, saying that they are still looking at the best way to serve both homeowners and the government. As the FHFA home price index is within 5% of peak levels already, this problem is melting away over time. We will have the FOMC decision today around 2:00 pm. Nothing major is expected, as there is no press conference. I suspect any action will be in the minutes, not the statement. Is the non-QM securitization market finally coming back? Maybe. As if now, non-QM loans are portfolio’d. However some hedge funds are thinking of selling MBS backed by these loans. Of course the big question will be how much overcollateralization the Street will require. High quality jumbos have been having something like a 50% equity tranche. That said, financial repression leads to investors reaching for yield, so this may work. Markets are down small as a historic snowstorm bears down on the Northeast. Bonds and MBS are up small. The Northeast is bracing for a historic snowstorm to start today and go through Tuesday night. NYC is expected to get up to 2 feet, while Boston could get close to 3 feet. The evening commute will probably start around noon today, as the National Weather Service has a blizzard warning for the tri state area beginning at 1:00 pm today. Expect to see a touch more volatility in the markets as desks will be understaffed for the next couple of days. Aside from the snowstorm, we have some important data this week, with the FOMC meeting and also Q4 GDP on Friday. The January FOMC meeting should not have any economic projections and I don’t anticipate anything market moving to come out of the press release, but you never know. The Street is forecasting +3.0% on the advance estimate for Q4 GDP. Homebuilder D.R. Horton announced better-than-expected earnings this morning. Sales, orders, and backlog are up smartly. Analysts will be most concerned about the Texas housing market. The stock is up a buck as of now. The conference call begins at 10:00 am. Note that both Lennar and KB waited until the conference call to disclose poor Q1 forecasts, so don’t feel the need to lift any Horton quite yet. Global stocks and bonds are continuing their post ECB rally. It is truly stunning to see bond yields where they are. If you think the US 1.83% bond yield is rock bottom, consider this: It is higher than 3 out of the 5 PIIGS (only Greece and Portugal are higher) and is multiples higher than many G7 yields. We live in truly extraordinary times. Yes, the German Bund is pushing towards Japanese yields. Rates are negative through 7 years in Germany right now, and you’ll pay 22 basis points per year to lend to the Swiss government for 10 years.That’s not an interest rate – it is a storage fee. With the ECB out of the way, attention turns to the Greek elections and the possibility (again) of Grexit. King Abdullah of Saudi Arabia passed away last night. Oil markets are taking the news in stride, as it probably will not affect OPEC policy. Existing Home Sales rose to a seasonally adjusted 5.04 million in December, from a downward revised 4.92 million in November. The median home price rose 5.3% year-over-year to $208,500. In economic news, the Chicago Fed National Activity Index fell by a lot in December to -,05 from .73 in November. Production indicators drove the decline, however employment is still positive. It is looking more and more like we took a bit of a swoon in December economically, given what we have seen with the ISM numbers and the Industrial Production numbers. The Index of Leading Economic Indicators rose from a downward-revised +0.4% to +0.5% in December. Markets are higher this morning after the European Central Bank announced a 1.1 trilllion euro quantitative easing program. Bonds and MBS have been all over the map this morning, but are rallying at the moment. The ECB QE program will consist of 60 billion euros a month, ending in September 2016. Draghi is walking a fine line here, trying to increase inflation and growth while at the same time mollify German voters that he is coming to the rescue of their Southern brethren. FWIW, I think Germany doth protest too much – their manufacturers have to love seeing the Euro get whacked. Such is the symbiotic relationship of the European monetary union – the profligate Southern European countries get to borrow at lower rates than they otherwise would, and the Northern European exporters get a depressed Euro which makes them more competitive. The formal announcement was very similar to what was leaked yesterday in terms of amount – 50 billion for 2 years vs 60 billion for 18 months. The markets were looking for something like 500 billion euros in QE, so it is an upside surprise. Bonds are rallying in Europe, with the German Bund challenging its lows of 42 basis points. US Treasuries are being taken along for the ride. Initial Jobless Claims fell to 307k, but are still the second week above 300k. Good numbers nonetheless. The Bloomberg Consumer Comfort Index slipped to 44.7 from 45.4 last week. Home Prices rose .8% in November, higher than expected according to the FHFA. On a year-over-year basis, prices are up 5.3% and are within 4.5% of their April 2007 peak. On a seasonally adjusted basis, New England was negative while the West Coast was highly positive. Note that the FHFA Home Price Index only looks at houses with conforming mortgages, which makes it a subset of the overall real estate market. Markets are lower this morning on no real news. Bonds and MBS are flat. The ECB decision is tomorrow. The market has priced in a lot of optimism for QE, so if they disappoint, rates could reverse hard. Keep in mind that US rates have been pulled down by Europe. The fundamentals of the US economy mean rates should be higher. A headline just crossed the tape saying the ECB is set to propose QE of 50 billion euros a month through 2016. Assuming they start next month, that works out to be $1.1 trillion – I believe the expectations were for the mid $500s billion. Bonds are not reacting to the news. Again, this is just a leak or speculation, not the actual decision. Housing Starts rose to 1.09 million in December, an increase from the upward-revised 1.04 million in November. 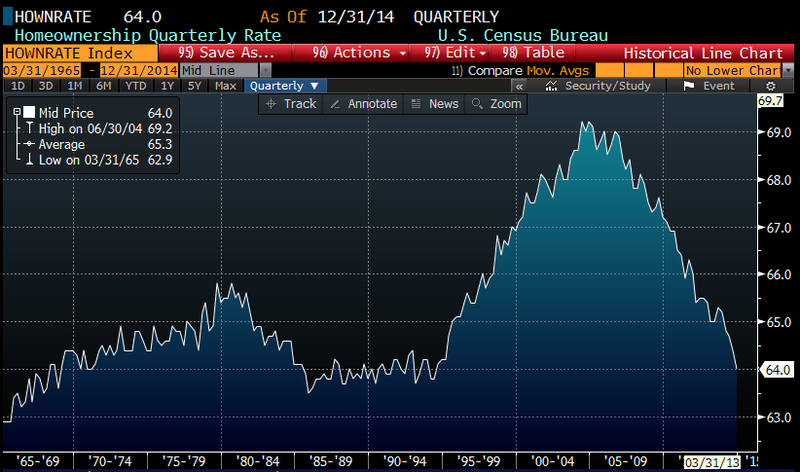 Building Permits fell however. Mortgage Applications rose 14.2% last week following up on an increase of 49% the week before. Purchases fell 2.2% while refis rose 22.3%. Refis are now 74% of all applications, a 10% increase from the beginning of the year. 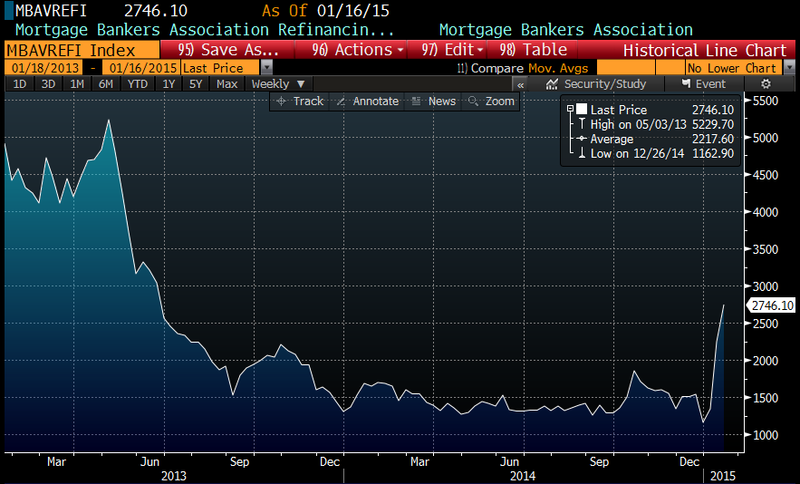 The MBA refi index is the highest it has been June of 2013, when the taper tantrum was beginning. Obama gave the State of the Union speech last night. If you are interested, here is the take on it. I don’t think he had anything to say affecting housing although he wants to increase the capital gains tax and he vowed not to roll back banking regulations. The Supreme Court is hearing arguments today challenging the Administration’s novel theory called “disparate impact” to prove discrimination. Basically, the Administration wants to be able to declare a lender guilty of lending discrimination if the numbers don’t comport with the demographic make-up of their market, even if the lender did not intend to discriminate. The Court is expected to rule in June. The rise in the dollar has been giving foreign real estate investors sticker shock. Foreign investment demand is behind a lot of the buying in big cities like NY, DC, SF, etc. The woes in Russia are having a big impact as well.